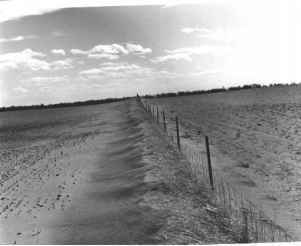 Figure 1 Severe soil erosion in a wheat field near Washington State University, USA. Photographer: Jack Dykinga, http:// www.ars.usda.gov/is/graphics/photos/k5951-1 .htm. Figure 2 Wind erosion on Ulen fine sandy loam, Grand Forks, North Dakota, USA. Photographer: Adrian Fox, http:// www.nrcs.usda.gov/TECHNICAL/ECS/agronomy/ Photo%20File/FrontAgr3.jpg. 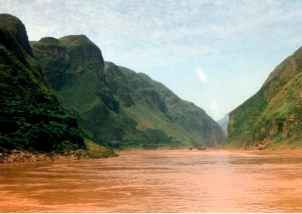 Figure 3 Yangtze River showing the sediment-rich water, the Three Gorges, Hubei Province, China. From http:// www.soilerosion.net/. 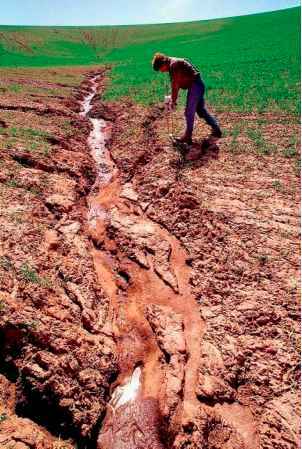 particular, the border area between land and water (e.g., shoreline, riparian zone) is extremely sensitive to erosion. Proper management of erosion in this type of ecotone is essential for achieving sustainability of ecosystems (e.g., biodiversity, efficiency in energy production) and for obtaining maximum socioeconomic benefit from environ mental amenity. 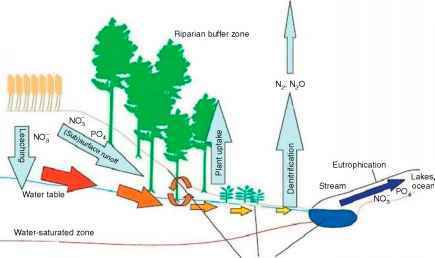 In this article, an innovative control of shoreline ero sion is introduced to demonstrate how efficient ecosystem management could be optimized between nature conser vation and environmental engineering. Protection of recreational beaches along ocean coasts and inland lakes, bays, and inlets, as well as finding a beneficial use for dredge material, has become a sensitive issue to a diverse public. It is often difficult to find a solution that makes good engineering sense while maintaining environmental responsibility. Current conventional methods used to retard shore line erosion include the installation of breakwaters, groins, and jetties. Sand replenishment is often used in conjunction with these methods when shorelines are being extended or restored. These techniques, though often functional, are costly and can detract from the natural environment. Dredge material management was viewed as a 'necessary evil' associated with overdevelop ment of coastal areas in the past. Through the years, hundreds of metric tonnes of sediment have been dredged annually for commercial and recreational purposes and subsequently discharged into land based disposal facil ities or into oceans, estuaries, rivers, and lakes. As the space for disposal facilities reaches capacity, and dis charge into water bodies becomes more of an ecological concern, the problem arises as to what to do with this material. The purpose of this article is to describe in detail how Presque Isle State Park, located along the shoreline of Lake Erie in Pennsylvania, implemented a unique erosion protection project, which also included the beneficial use of dredge material. This low cost, innovative demonstra tion project minimized erosion in the lesser energy zone of Misery Bay in Presque Isle State Park by utilizing native plants, bioengineering, dredge material placement, and nonconventional erosion practices.